A fun Schwartzenegger 90s movie that plays out like one of the better B action movies of its time, complete with high-tech weapons and some pretty cool stunt work. One of the better Schwartzenegger 90s action movies, this one has our hero playing a witness protection agent who gets mixed up in an arms dealing scandal involving new kinds of high-tech weapons and corruption at the highest level. The dialogue and story may be dopey, but the action makes it all kind of fun. 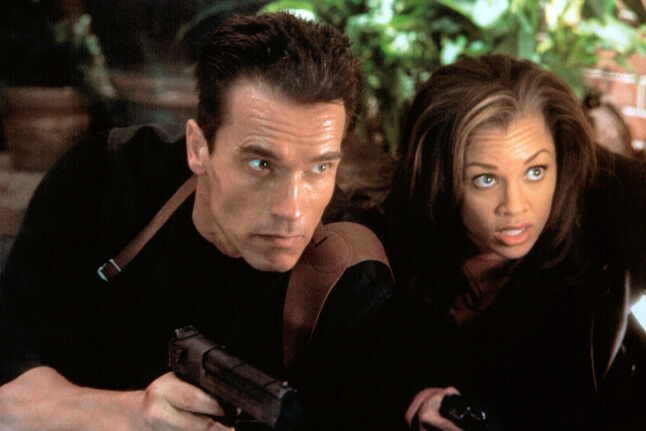 Arnold Schwartzenegger was once the thing of action movies. It was a different time, when all you needed to be a big star were muscles and personality, and guys like Arnold carried the nineties action genre about as far as it could go. Other guys like Seagal and Vsn Damme tried hopping onboard their train, and for a time, things even worked out pretty well for them. But at the end of the day, it was Arnold, Sly, and Bruce who were left standing. And one thing those three mega stars had that the other action stars of their time didn’t, were franchises. With Arnold it was the Terminator films. With Sly it was Rocky. And with Bruce it was Die Hard. There was the sci-fi action star, the boxer, and the gritty terrorist fighter. And good as they were, all three stars were more or less interchangeable. There’s no doubt about it, Arnold could have starred in Cliffhanger and Bruce could have starred in Eraser. But as a Schwartzenegger vehicle, that movie about government corruption and illegal weapons trading turned out to be a lot of fun. Eraser is most definitely a movie that was a product of its time. The action feels very over the top and ridiculous, (a fight with escaped alligators? Jumping out of a plane to sky dive after a falling parachute bag?) But that’s just the way these guys liked it. You can’t look at the stunts in Die Hard and really say they’re any different (bungee jumping off the side of a building while the roof explodes?) but they certainly felt different and that’s a testimony to the storyline and atmosphere of that movie as a whole. 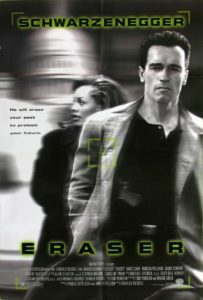 In terms of storyline, Eraser is kind of weak. Arnold plays U.S. Marshal, John Kruger. He’s a man who disappears people for the Witness Protection Agency by giving them new identities and then protecting them from anyone who comes calling. But isn’t the whole point of the witness protection agency that no one is supposed to know your new identity? This movie assumes that people will end up finding the witness and so Kruger’s character is more like a bodyguard than an agent. And speaking of how the Witness Protection situation works, witness Lee Cullen, (Vanessa Williams,) apparently has no idea that things are about to get messy for her at work, after she secretly records the illegal activity that her bosses are up to. It’s one thing for her not to expect that her bosses will find out while she is still working there, but it’s another for her to have no idea how witness protection works (after she has already signed on to do it,) and for her to think that her life will go on being exactly the same afterwards. I’m referring to the scene where she first meets Kruger, and he criticizes the other agents for not telling her that things were about to get messy. She couldn’t figure that out for herself? This is small nit-piking compared to the big picture, but the thing is, there is a very simple story at play here. A witness has recorded evidence on a secret disk that shows her high profile company is dealing in illegal weapons by selling them to terrorists. And for some reason, the secretary of defense is involved. Why in the world would this guy have anything to do with high tech weapons coming onto U.S. docks and then being sold off to terrorists? The same goes for some of the high up characters that Kruger counts as friends, until he learns the truth about the corruption. Since it’s pretty much impossible to speak about the villain without giving away a mild twist, (even though it comes about halfway into the movie,) let’s just say that there’s a great cast here. From James Caan to James Cromwell to James Coburn (I know, a lot of James’,) this one even casts the bit parts well. Even Mad Men’s John Slattery is on hand in a tiny role. But these aren’t the characters who stand out. It’s the Italian mob characters who are actually the most fun here, like a witness who Kruger saves at the start of the film, and then turns up over and over again to help out after that. The humor isn’t very intelligent, but it’s still kind of fun. While Eraser feels like a very generic film, the kind we have seen again and again, it does have one kind of creative thing going for it. This movie invents it’s own high-tech, sci-fi weapons. It features electromagnetic guns, or rail guns. These things fire out green neon aluminum rounds at close to the speed of light. And they look fantastic. What we see in neon green ends up being the trail of the aluminum rounds, after they have been fired. And the deeper we get into this movie, the more we get to see these cool guns being used. It’s the only sci-fi like element to the movie, (apparently these guns really do exist, but the real ones are nothing like what is depicted in the movie,) but it is incredibly cool, and gives the movie a sense of creativity where one is surely needed. Other than that, however, this film feels very familiar. Jumping out of a plane, for example, has been done again and again in movies, from Drop Zone to Point Break to Iron Man 3 to Mission Impossible Fallout. Now, most of those movies came after Eraser, but the point is that the stunts don’t exactly hold up today, (compared to other movies from that time, like Die Hard or Cliffhanger, which would still feel pretty fresh today.) It’s fun to watch Arnold at his most confident, A List star status level, delivering corny one-liners as if he was James Bond, but make no mistake, this is no intelligent material. The action is okay, and the villains are somewhat fun, but for the most part, this movie is nothing special.